In a comic book landscape too often dominated by explosions, superpowered violence, over the top action and bloated marketing budgets, We Can Never Go Home from BlackMask Studios comes across as essential reading. 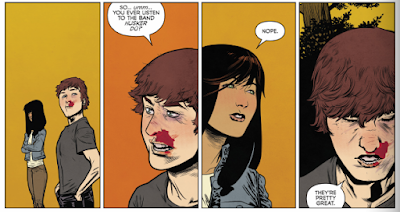 Channeling the outcast spirit and perspective that made X-Men resonate with so many readers, We Can Never Go Home trades superheroics for gritty crime shenanigans and convoluted continuity for a simple, but compelling, self-enclosed narrative. What started off as an impulse buy has, 45 minutes later, become one of my favourite comics of the year. Meet Madison and Duncan, two teenagers who find themselves on the run after a violent turn of events. Madison possesses superhuman strength while Duncan gets by with a sassy mouth and a handgun. Duncan is the school weirdo/bully punching bag while Madison exists in the popular girls clique, but both feel out of place in the savage world of their small town high school. The pair start off as strangers who just happen to go to the same school but soon realise they are something of kindred spirits. Brought together by a mixtape they form a strong, though troubled, friendship, grounded on the fact that they both genuinely care about each other. What follows is a challenging yet warm tale of outcasts, crime, and teenage rebellion. Matthew Rosenberg and Patrick Kindlon’s script handles the whole affair with an undeniable level of authenticity grounded in the universal experiences of being a teenager. The dialogue in particular feels straight out of real life. It flows well but possesses a certain clunkiness that makes it feel like actual things people have said and not just words on a page. That said there is also plenty of witty banter and I found myself laughing out loud more than a couple of times. In terms of the actual narrative Rosenberg and Kindlon, to their credit, keep it fairly straight forward, preferring to focus on the relationship between the two runaways. Things escalate in a somewhat linear manner with plot ups and downs being exactly where you would want and expect them. This is ultimately a positive as the real standout moments of the book weren’t the big action scenes, but rather, how they affect Madison and Duncan’s relationship. What the plot really does is facilitate great character moments and interesting character development. Bringing these characters to life is the wonderful line work of Josh Hood, with Brain Level providing art for the last three pages of the final issue. 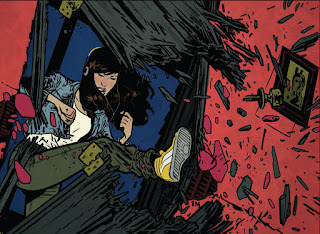 Hood’s work is bold and precise, delivering an artistic style strongly reminiscent of Chris Sprouse and Jamie McKelvie. 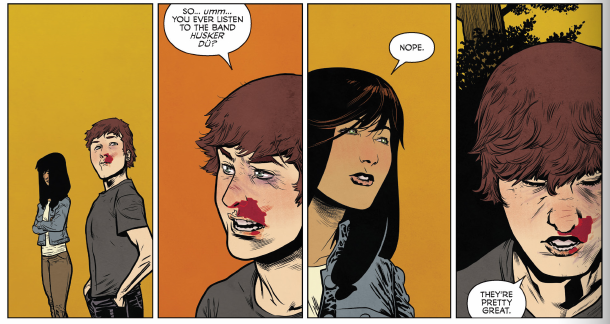 In particular some of his more panel heavy layouts reminded me of McKelvie’s work on young avengers. Hood handles intimate conversations as easily as a superpowered brawl, bringing a sense of drama and nuance to every panel he touches. His artwork glimmers with the polish of a seasoned pro, and if the premise hasn’t sold you then I guarantee a quick flick through his art will. Hood’s pencil work is complimented by the stunning colours of Amanda Scurti and Tyler Boss, whose bright and varied palette tie it all together. Also worth noting are Jim Campbell and David C Hopkins, who handle lettering duties. 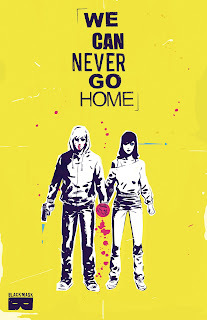 We Can Never Go Home is a story about bad choices, violence and outsiders. Instead of getting bogged down in the world and ethics of superpowers, We Can Never Go Home simply uses powers as a tool to explore the much more interesting themes of adolescence and friendship. 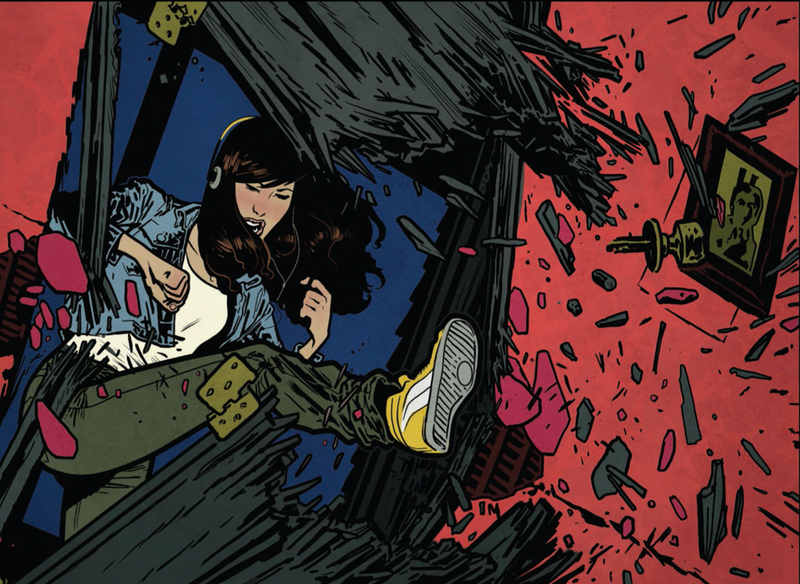 For a book that doesn’t pull a single punch, it sure has a hell of a lot of heart and I cannot wait for more in 2016.